The joys of women’s college gymnastics, the best show on TV. The LSU Tigers get pumped up for their meet against the Oklahoma Sooners at the Pete Maravich Assembly Center in Baton Rouge, Louisiana, on Jan. 9, 2016. Last year, before Simone Biles blew everyone away at the Olympics by winning four gold medals and being generally awesome, UCLA’s Sophina DeJesus showed the world that women’s gymnastics isn’t all about nationalism, gold medals, and overwrought NBC coverage. It can also be a whole lot of fun, for spectators and for the gymnasts. DeJesus dabbed and nae-naed her way to viral fame, a profile in the New York Times, and an appearance on The Ellen DeGeneres Show. But her routine is not the exception in NCAA gymnastics. It’s the norm. And you can watch performances that are just as thrilling on any given Friday or Saturday or Sunday from January to April. Over the past few years, women’s college gymnastics has taken off all over the country. The SEC and Pac-12 television networks devote hours of programming time to women’s college gym each weekend. Attendance at meets is climbing, with schools like Utah, Alabama, Georgia, and LSU at or near capacity for every home competition. And Olympic medalists are getting in on the action. Madison Kocian, who won the team gold and individual uneven bars silver in Rio, and Kyla Ross, who was a member of the 2012 gold medal–winning team from London, both just started their careers as UCLA Bruins. Ruby Harrold, a member of Great Britain’s Olympic team from Rio, just matriculated at LSU. Maggie Nichols, the 2015 world championships bronze medalist on floor exercise, is dominating at top-ranked Oklahoma. College gymnastics, compared with the elite international version, is the same sport but a different game. There are still four apparatuses—the vault, the uneven bars, the balance beam, and the floor exercise. The routines are still evaluated subjectively, so you can feel outraged or confused about any score that doesn’t seem quite right. But the goals are different. College gymnastics still uses the “Perfect 10” system that’s now obsolete at the elite level, and the gymnasts compete according to modified Level 10 rules, which are less demanding than the ones used by Olympic gymnasts. This means you’ll see slightly easier vaults, fewer release moves and complicated pirouettes on bars, and just three tumbling passes on floor. In college, the focus is on execution rather than pushing the body to its limits. It’s less about doing every crazy skill in the Code of Points than doing a few things perfectly. And since you can still get a perfect score, that attention to detail can be rewarded. Just five weeks into the college season, there have already been seven Perfect 10s. College gymnastics is a true team sport. At the elite level, athletes are thrown together right before major competitions and dubbed a “team.” In college, they train together, day after day, year after year. They compete together every weekend for three months out of the year. (In an average, non-Olympic year an elite gymnast might compete just three or four times.) Their lineups shift throughout the season, just as in other team sports. Freshmen get their shots to gain experience while second-stringers come off the bench to fill a void left by an injured athlete. And most of the competitions are dual meets, a setup that mirrors other sports where opponents face off against one another. At the end, there’s one winner. For college gymnasts, the team result is everything; the rest is just commentary. They don’t even bother holding a separate competition to crown the NCAA all-around champion—the gymnast with the best four-event tally during preliminaries, when all of the athletes are focused on helping their team make the Super Six Team Finals, is declared the winner. It’s clear from watching the meets that the gymnasts have embraced this team-first mentality. After years of competing at the elite or club levels, where the focus was on individual success and outcomes, they get to subsume their goals to those of a very supportive, boisterous collective. When an NCAA gymnast is on the balance beam, she’s competing for her teammates, who are screaming for her from the sidelines. When she lands her dismount, she is mobbed with hugs and high-fives. After every vault landing, stuck or otherwise, the entire team treks down the runway to congratulate the gymnast. And on floor, as the gymnast dances and tumbles her way through 90 seconds, her team is there on the sidelines, performing her choreography in solidarity. DeJesus’ routine caught on (and Lloimincia Hall’s back in 2014), in part, because it played against the expectations of those who’d only seen women’s gymnastics during the Olympics. DeJesus performed to crowd-pleasing music, used popular club dance moves, and looked like she was having a blast. While DeJesus is notable for her dance ability—as a kid, she’d been on the TV show Hip Hop Harry—every floor routine in college gymnastics is constructed to please the crowd. This year, one gymnast tumbles to Fox’s NFL theme music. Another plays the part of a caged lion. Oklahoma’s Nichols, performing to a song called “Don’t Let Me Down,” plays an orphan worried about being reunited with her birth mom. While not every routine is as successful as DeJesus’, there’s something to be said for going for maximum show-womanship. Perhaps all these gymnasts are having so much fun because, for most of them at least, the college game is their four-year farewell tour. There is no professional league for gymnastics. Although there are many former elites in the NCAA, most competitors did not compete at the sport’s top level before college. Even for those who did make it to the pinnacle, it can be very hard to get back into elite gymnastics after college—their bodies are more beat up after an additional four years of training and competitions. For all but a small group—among them UCLA’s Mohini Bhardwaj and Anna Li, University of Denver’s Jessica López, and Georgia’s Brittany Rogers—college is the end of the road. But you could do a lot worse than finishing out your competitive career on live TV in front of packed houses. In addition to turning out gymnastics fans and young gymnasts, the college version of the sport taps into pre-existing fandoms. When I attended a meet between UCLA and Utah in Salt Lake City in early 2015, I sat next to season ticket holders who’d started attending competitions in the mid-1990s because they had been Utah basketball and football fans. There is no other context outside of the Olympics where gymnastics draws in viewers who are not explicitly fans of the sport. And college gymnastics is just as good on television as it is in the arena. Sports, like award shows, are meant to be enjoyed live. You wouldn’t want to watch a basketball game if you already knew the final score; ditto for gymnastics. While NBC insists on showing Olympic gymnastics on a tape delay, the SEC and Pac-12 networks treat college gym like a real sporting event. A lot of the fun of watching a college meet comes from not knowing how it’s going to turn out. Unlike in elite competitions, where the U.S. women win titles by 8 points, the margins in college gymnastics are razor-thin, typically coming down to just a few tenths—just a handful of unstuck vault landings or beam wobbles. The Olympic version of gymnastics is kind of like the films released during the winter holidays to be considered for the Oscars. They’re “serious” and “important,” and they win all of the big prizes. 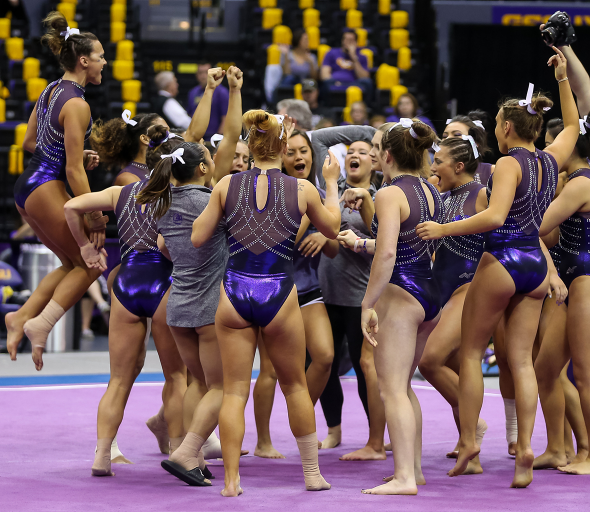 College gymnastics is like your favorite television show—there every week with characters (and routines) you’ve come to know and love over the course of a season. Olympic gymnastics is more difficult and daring. College gymnastics is more fun. If you’re a fan of the sport, you’re doing yourself a disservice if you’re not watching both.